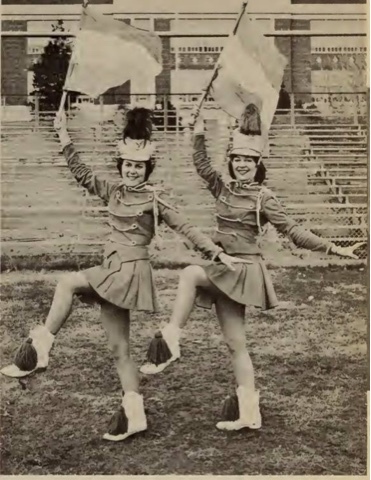 My Genealogy Girl: Sports Center Saturday: My Mom the Majorette "We were much cooler than cheerleaders"
Sports Center Saturday: My Mom the Majorette "We were much cooler than cheerleaders"
State Champion Twirler Anne Pierce led the largest group of majorettes in several years as they brandished their flags and fire torches at featured events during the year. By special invitation, they appeared with the marching band at the first U. S. College All'Star Game and the opening of District Stadium, executing several precision drills to the martial tunes of the band. Pint-sised addition to the majorettes, Elaine Pierce served as team mascot. She came to the group at the beginning of the year and performed in many of their routines. By request the girls also appeared in the annual George Washington parade at Alexandria. As a tangible reward for their baton twirling at school affairs, the majorettes received recognition at the sports banquet in the early part of November. Flagbearing majorettes, Co'Captain Sharon Sauls and Captain Anne Pierce, strut across the field during a practice session.